If you have followed for awhile, you probably know I change things a lot. How about that! 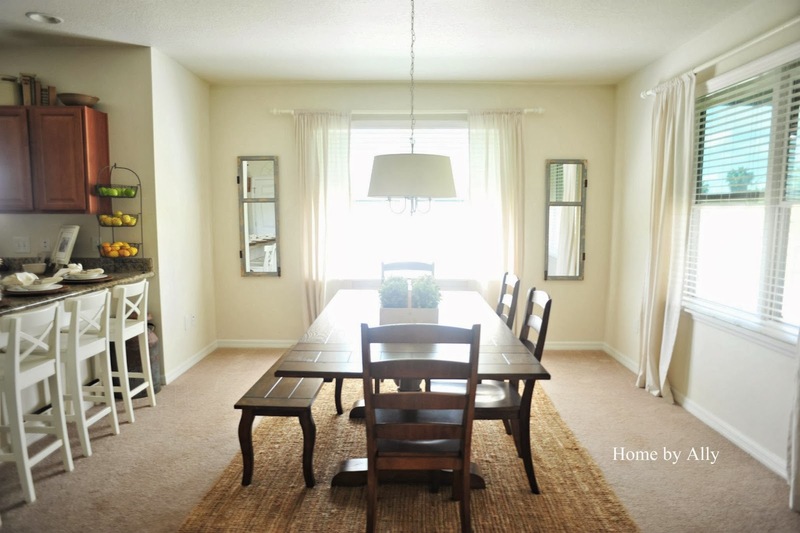 So since we purchased our home, I actually have thought more than once about selling the popular and beloved trestle table of mine! I really need to take new photos of it because I purchased slipcovers after we moved in which I loved as well. 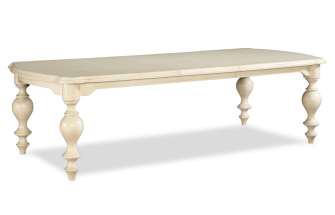 The table is awesome with a farmhouse style top, adorable almost french style legs and a double trestle base. Seats 6-8 comfortably and would come with 4 chairs as well as the bench. Oh and did I mention that in the photos, the leafs are out but they actually hide under each side. Pretty cute if you ask me and pretty handy as well! If you're interested in hearing more about it, email me and we can talk. I haen't decided a price yet and I'm not even sure if I want to sell right this second but I guess if I received a reasonable offer that I couldn't refuse, I might consider it. Here's a few below just for you to get a general idea. 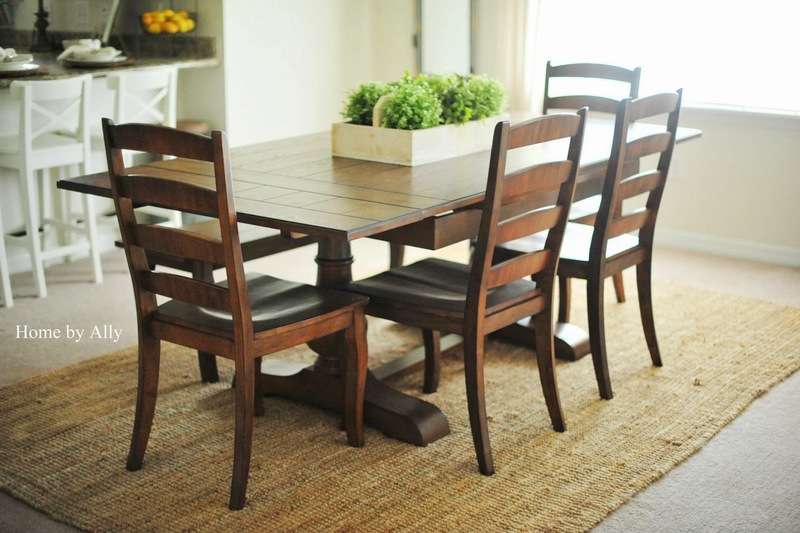 I'm really craving a nice round table with a chunky base and I hope to find that it has a rustic finish. I want to pair it with slipcovered chairs and a new chandelier that I've yet to order. So let me show you some inspiration photos while I've been on the hunt. 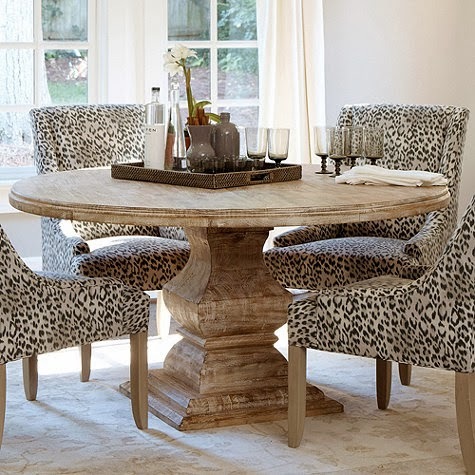 I started with Ballard Designs and ultimately loved the Andrews Pedestal Dining Table which comes in 48" and 60". You can read more about it here but it may or may not be out of my budget. 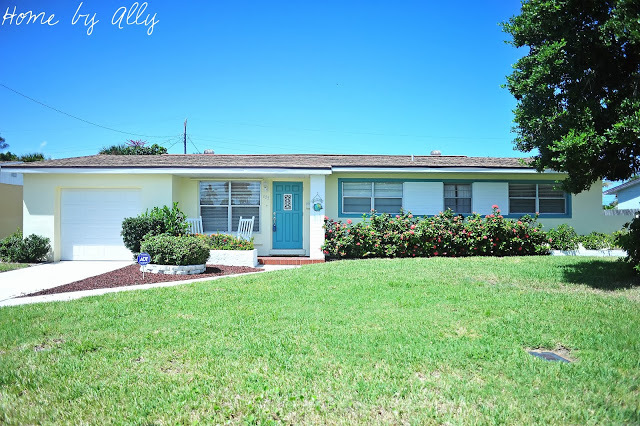 My husband will probably say I have a budget but in my head, I just want to find something second hand and transform it. Those makeovers are so much better anyways right? Wrong. I love new stuff too. Ha! I also checked Restoration Hardware. Now people, let me go ahead and get one thing straight… I laughed because someone asked me this one time. 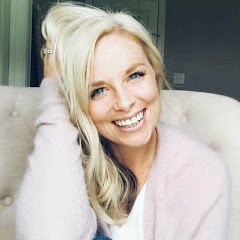 Just because you blog… does not mean you have money. Ok, there I said it! Ha! But at the same time, I do know bloggers who do things "on a budget" who do have considerable incomes and I just kinda laugh and sigh… if they only knew what my budget was ;-) Hah! Ok! 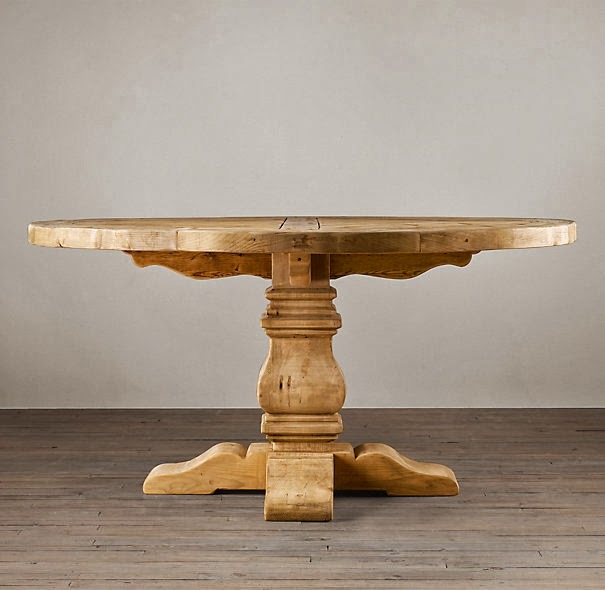 So back to the table, this is a pedestal salvaged wood round table that you can find more information about here. I thought about checking the outlet store to see if it was any cheaper but most likely, this one will just look pretty on my computer screen because it's out of my pretend budget. Ok? Unless you can make this for me. Then we can be friends. Let's be honest. I really am not sure what I am wanting. Because when I want on Paula Deen Home… I spotted this lovely. But once again, who am I kidding?! Just kidding, it's too long for our space. But it looks so pretty in my pretend house in my mind. 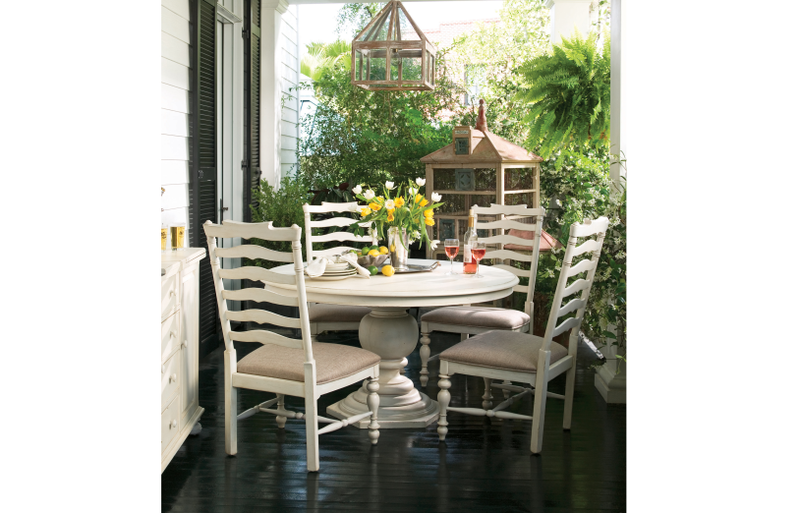 You can find the River House Dining Table from Paula Deen by clicking here. And I loveeeeee this one too. But then I can't do my slipcovered chairs. Well, I could. I could just spend a little more and get linen slipcovered chairs… Oh, now my brain is going. Find this one here. Clearly, I have expensive taste. 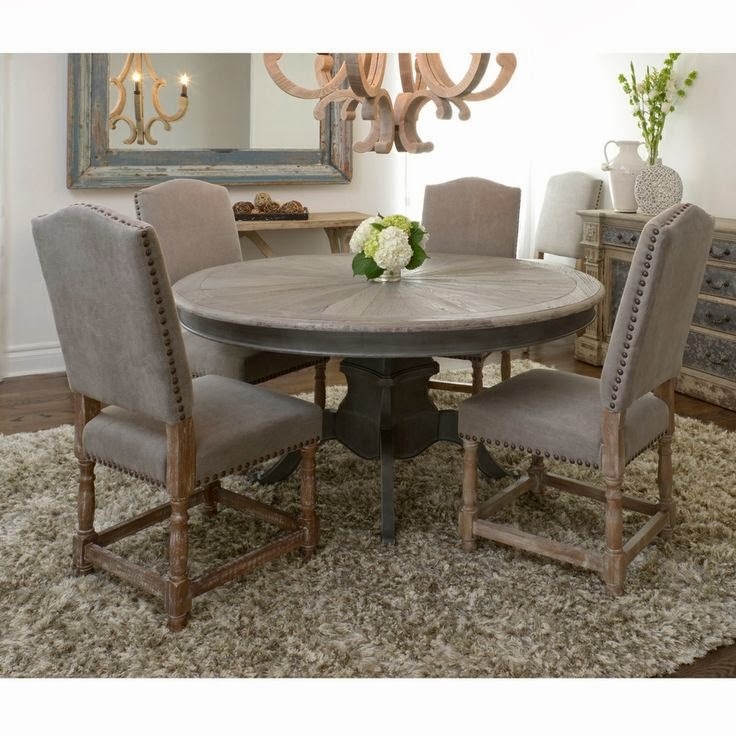 Love this table from Overstock that you can find here and I have to say I actually love everything about the room except for the rug. The chairs are gorgeous and that chandelier is to die for… but too much for me. I've become a huge fan of Joss and Main. If you haven't heard about it, it's basically a website that brings you amazing finds including furniture, decor and other things for your home at a seriously discounted price. I keep watching every collection for my perfect dining room table. Maybe one day I will get to curate a collection for them. If you haven't ever heard of Joss And Main, email me and I will send you an invite! You will love it! I love that weathered round one (the second table) the best by far!